Shortwood Teachers' College began operations on September 28, 1885. 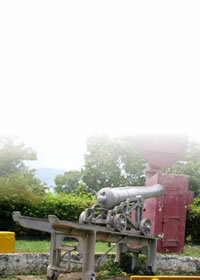 It was founded as part of a package of social, economic and political reforms spearheaded by Sir John Peter Grant, governor of Jamaica after the Morant Bay Rebellion. By 1880, the Superintendent Inspector of Schools voiced the need for more trained female teachers and the Government sanctioned the projects. 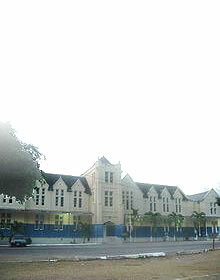 The first home of the College, then known as the Jamaica Female Training College, was in lower Barbican House in St. Andrew. Eighteen students were enrolled by Mrs. Amy Charlotte Johnson, the principal (1885-1898). A case of yellow fever at the College during the first year of its existence induced the authorities to remove it to Camperdown where it was held for a year. In 1887, it was moved to the present site at the Shortwood Estate, which was bought for the purpose by the Government and the name was changed to the present one. Shortwood Teachers' College presently trains over 600 students to teach at the early childwood, primary and secondary levels. This is the main building on the College Campus. 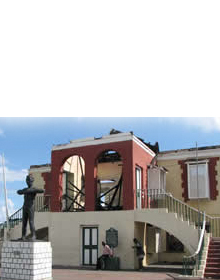 The original building was destoyed by fire in 1939 and the present structure was erected in 1940. It is a two storey building made of reinforced concrete. The facade is in the Palladian style, with a projected gable roof incorporated into the design. Glass panel windows are used throughtout the structure. The ground floor is tiled concrete and the upper floor is timber.